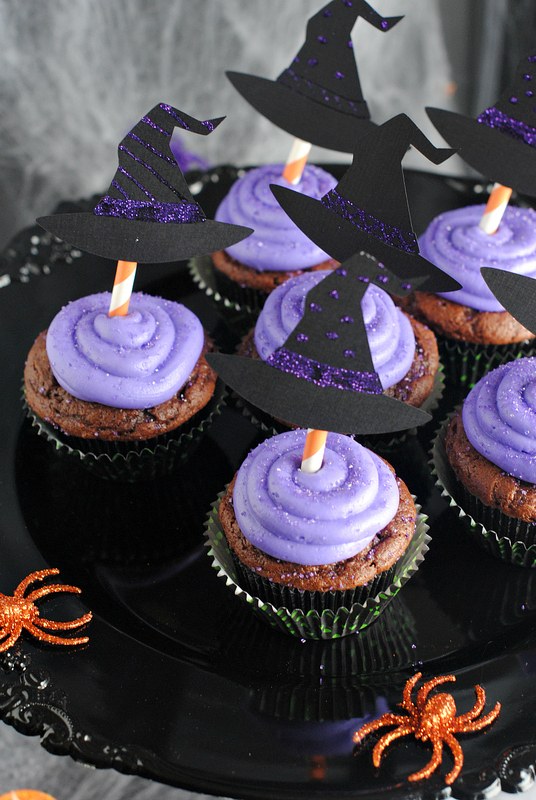 A Peek at the Fun: These witch cupcakes are a cute and festive way to celebrate Halloween and they are easy to put together with these Halloween cupcake toppers. 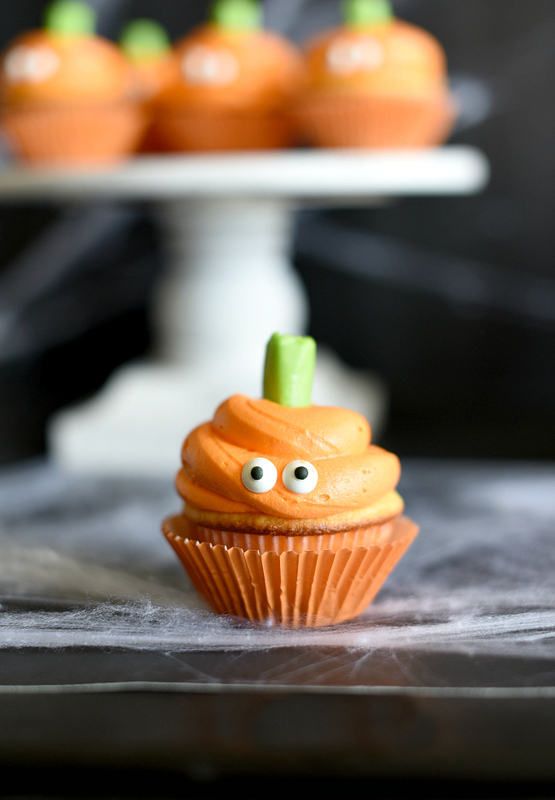 Also, learn to make a cute Halloween cupcake stand in about 5 minutes. You know that moment when you get an idea and it’s a really cool idea and you get really excited about it to the point that you maybe make a little bit of a fool of yourself? And it’s embarrassing but you’re just excited? That was us when we were standing in the party store and this idea started to come to us. 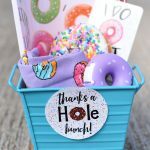 We saw this fun black plate for Halloween and then the cute orange goblet with it and knew we could create a pretty awesome Halloween Cupcake Stand with it. And we got pretty excited in that moment. And we knew we had cute witch cupcakes that needed a happy place to call home and it all came together so great! The best news though? 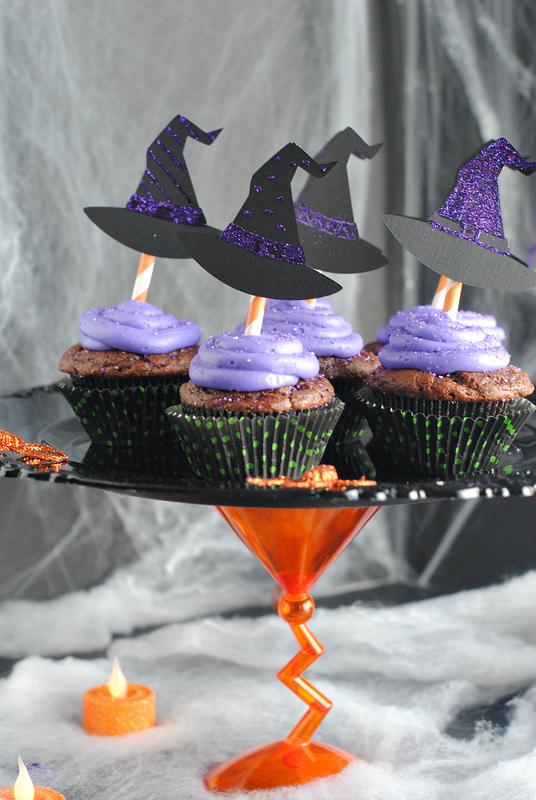 It cost under $10 to make this Halloween cupcake stand and only takes about 1 minute! These are super simple to make. Here’s what we did. To make the witch hat Halloween cupcake topper cutouts, we just found a witch hat clipart online and cut around it. Then we added purple glitter to it and taped them onto a cut straw. Pipe on the purple frosting and add your toppers! We found our platter and goblet at Zurchers in the Halloween section. You can get creative here and find any combo of plate and cup to make this. We also want to note that ours isn’t super sturdy because of the nature of the goblet we used. That zig zaggy bottom looks cute, but makes the cupcake stand a little wobbly. If you want something more solid, use a more sturdy cup for the bottom. Turn your plate over and trace the outer rim of your cup/goblet on the bottom. Put hot glue on the part you just traced. Add your cup and allow it to cool. And you’re done! It’s that easy. 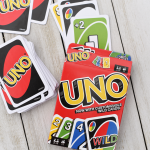 A lot of FUN right? 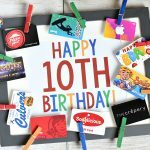 Now you need to throw a party! 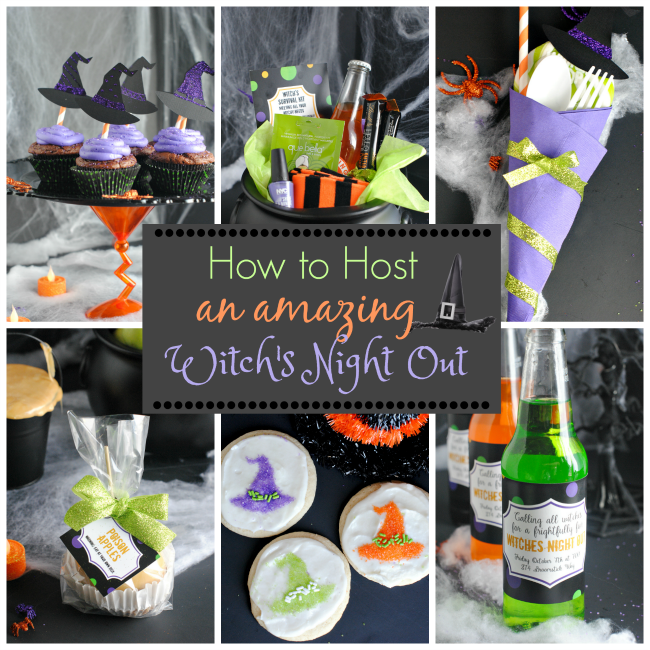 Have FUN making witch cupcakes and a cute Halloween cupcake stand!